One of the many ways to make a gift to Blessings in a Backpack is by naming us in your will or trust. Some supporters might choose this option so they can leave a lasting contribution without affecting current financial security and freedom. Planned (or estate) gifts offer an avenue for supporters to leave a legacy of fighting childhood hunger. 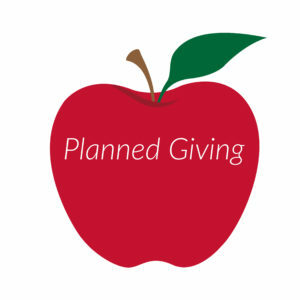 Click here to learn more about our Apple Legacy Council, which recognizes those who have made plans to include Blessings in their estate plan. *If you’d like to designate your support to help feed children at a current program site, please include the program’s name on the check’s memo line. If you name a program site at which Blessings in a Backpack is not currently operating, your gift will be allocated to serve children in the geographic area of your requested school. **If you’d like to designate your support to help feed children in a specific geographic location, please include the desired location on the memo line. A gift of securities can be made by having your broker transfer securities directly to Blessings in a Backpack’s account. Please contact our Associate Director of Development at (312) 366-2749 or email Brent if you have any questions. Blessings in a Backpack does accept donations of new backpacks or drawstring bags. Unfortunately, we cannot accept satchels, roller bags, messenger bags or clear or mesh backpacks. If you would like to donate new backpacks to Blessings in a Backpack, please email Lisa or call (800) 872-4366, ext. 101. If you are interested in donating other items that you think might be of use to Blessings in a Backpack as we work to feed children throughout the country, please email Jenny or call (502) 794-2408.